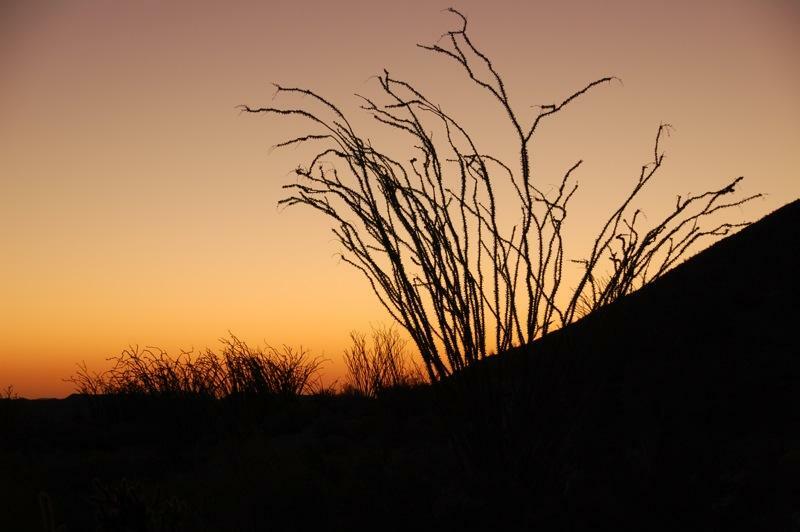 Spikes of Ocotillo were silhouetted by glowing and changing pastel colors of red, orange and finally yellow under the deep blue sky as the sun began to rise on the southeastern horizon each morning during our stay at Agua Caliente County Park, 111 miles from San Diego in the Anza-Borrego Desert region. 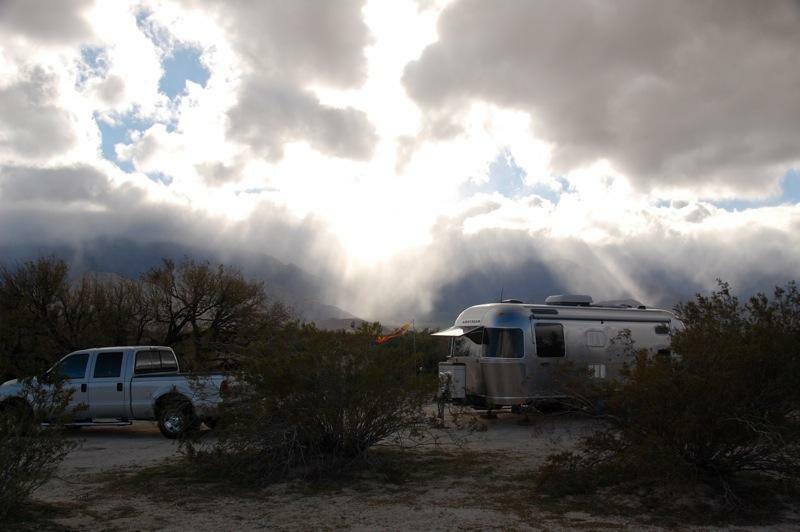 Distant Vallecito Mountains to the north began to bask in the warmth of the sun while the trailer still rested in the chilly shade. 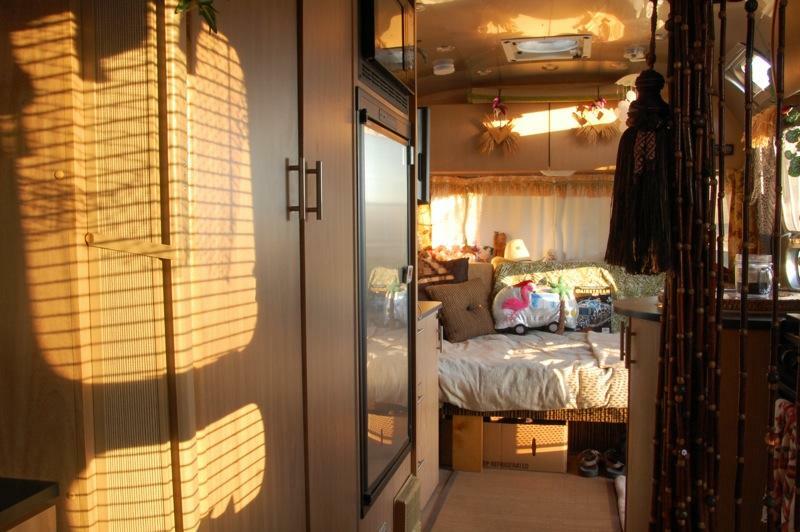 Finally, glorious rays of golden sunlight streamed into the trailer while I savored my first cup of freshly brewed joe, nice, hot refreshment perfect for waking up on a chilly morning… almost as good as hot, hot… hot chocolate! We start the days by walking the dogs and taking turns hiking the trails. Since dogs are not permitted on the trails, one of us stayed with the dogs while the other one hiked. For safety, we have our two-way radios turned on. Starting before it got too hot, I explored the Moonlight Canyon Trail. I started at the eastern side of the park, where the trail heads east before looping southward below the campground and through a canyon. 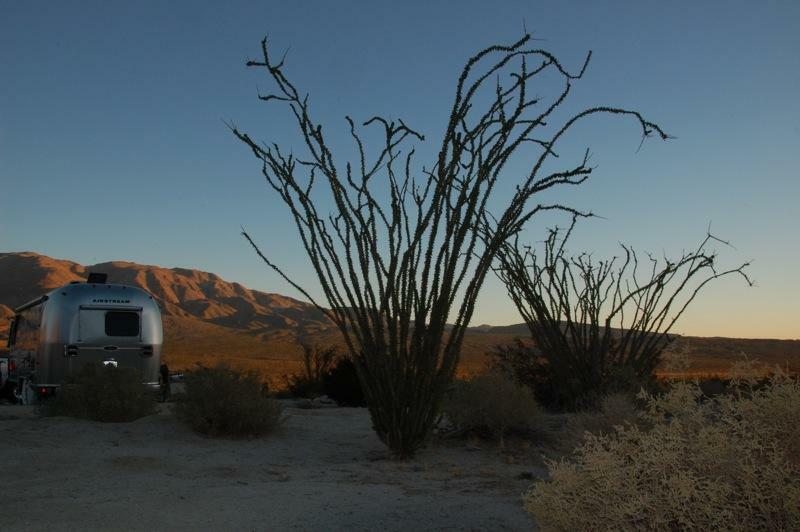 I saw wonderful vista views and many ocotillo as I headed east. This part of the trail is wide enough for a golf cart to travel on and gradually increases in elevation as it turns south. The southern portion the trail narrows to a footpath as it leaves the warm sunlight and enters the shade where cool morning air pours down from the steep granite canyon walls. 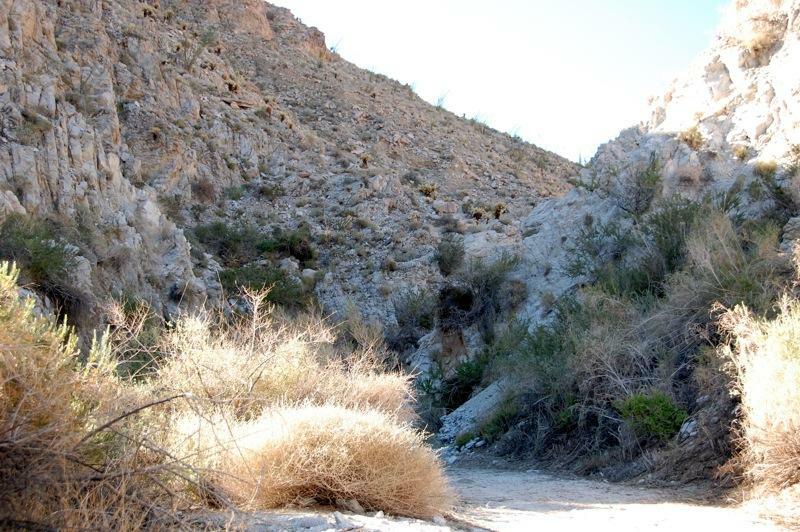 Water seeps down into this canyon from the Tierra Blanca Mountains promoting lush growth of plants that need to be hacked back periodically by volunteers and park staff to keep the trail open. I could hear water trickling and frogs at times, but a swarm of bees seemed to claim a portion of the trail ahead as I rounded a bend, convincing me to turn back. I obliged and went back to the campground the way I came and explored this trail at its official beginning in the southern part of the campground, where it steeply and unpleasantly goes uphill and into the sun by mid-morning. On other days, I explored more features of this campground area, including its water features, store, wildlife, and other trails. But that is another story. After a morning hike, I enjoyed the park’s hot showers that cost 1 quarter per 2 minutes. Afternoons were spent reading and relaxing. The sun disappeared behind a nearby mountain by 3:15 pm and the temperatures quickly dropped. 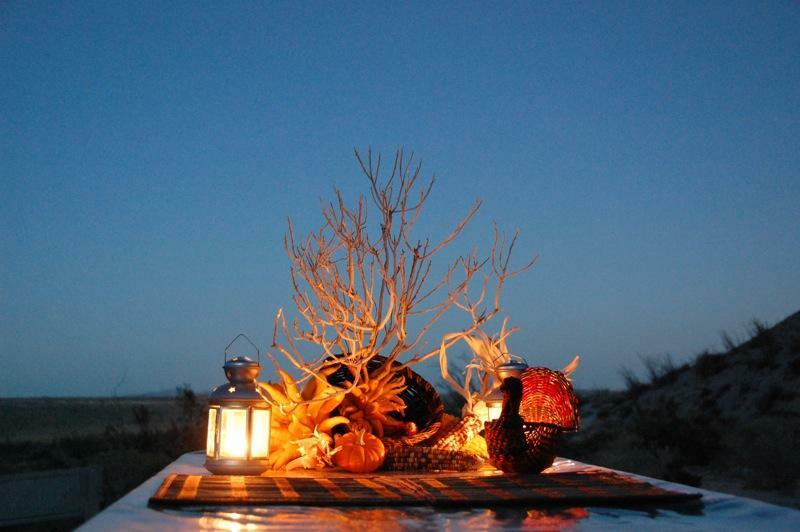 Coyotes, the children of the desert night, could be heard as the waxing moon rose and the bright stars reappeared as we enjoyed listening to classical music such as this while watching the moon traverse the sky through the Safari’s Vista View windows. 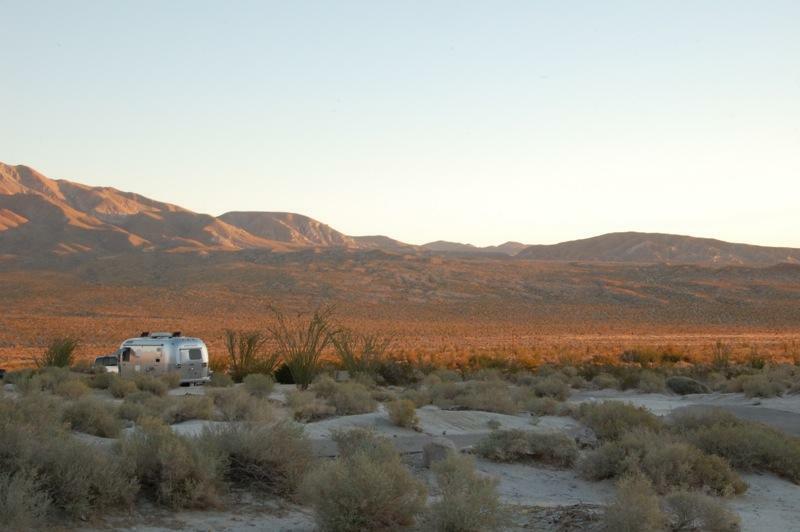 Thanksgiving season is a wonderful time to visit Agua Caliente County Park, a San Diego County Park that is 111 miles from San Diego. Agua Caliente (Spanish for hot water) is best known for its geothermally heated hot springs, which attract visitors who like to enjoy the pools and therapeutic spa in a desert oasis setting. 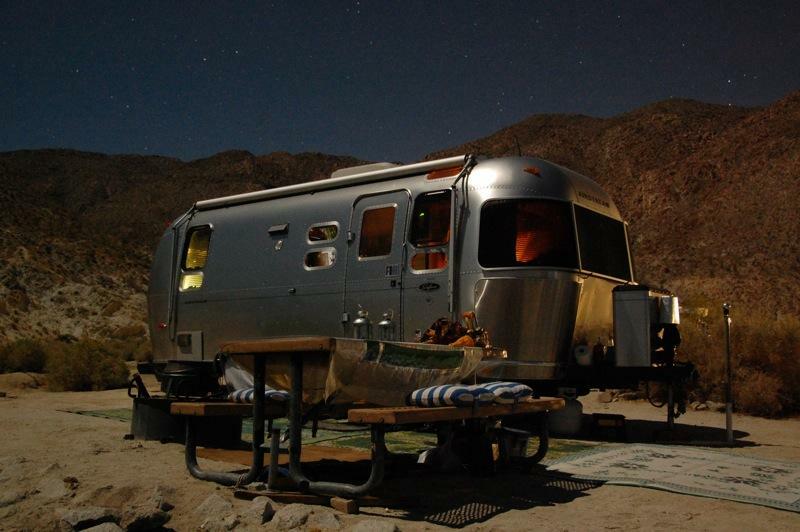 There are also spectacular vistas, trails, abundant wildlife, and full hookup campsites. We are thankful that this park now allows dogs, so we booked five nights and thoroughly enjoyed our stay. Kumeyaay Native Americans once lived here centuries ago. The first European to visit the area was Spanish explorer Juan Bautista de Anza in 1775. Miners, pioneers, soldiers and prospectors were thankful for the relatively abundant water supply here after crossing the arid desert. 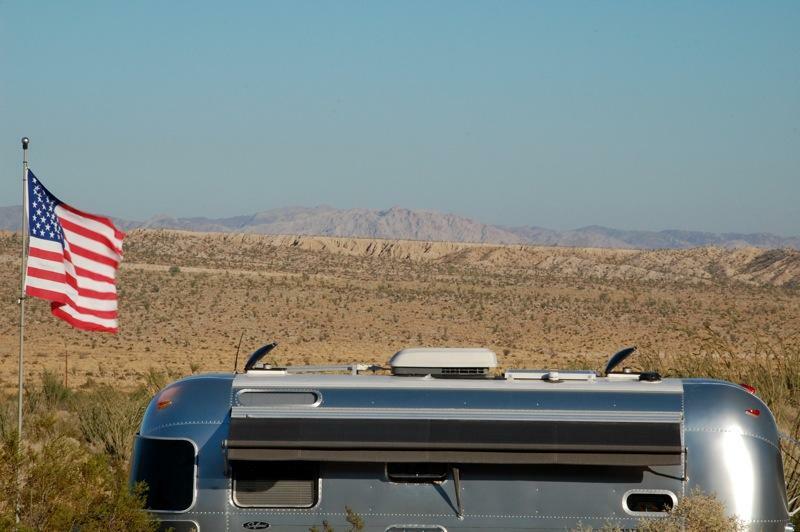 We were thankful for the view. 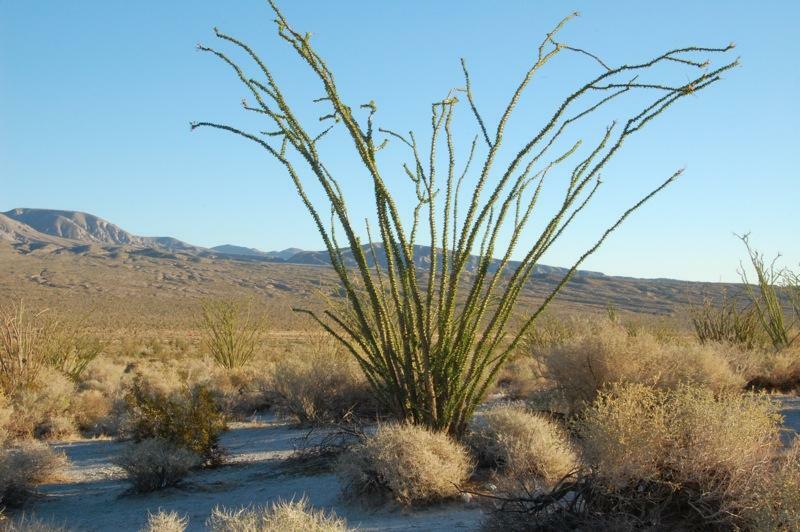 The Ocotillo were very green from the recent rains. 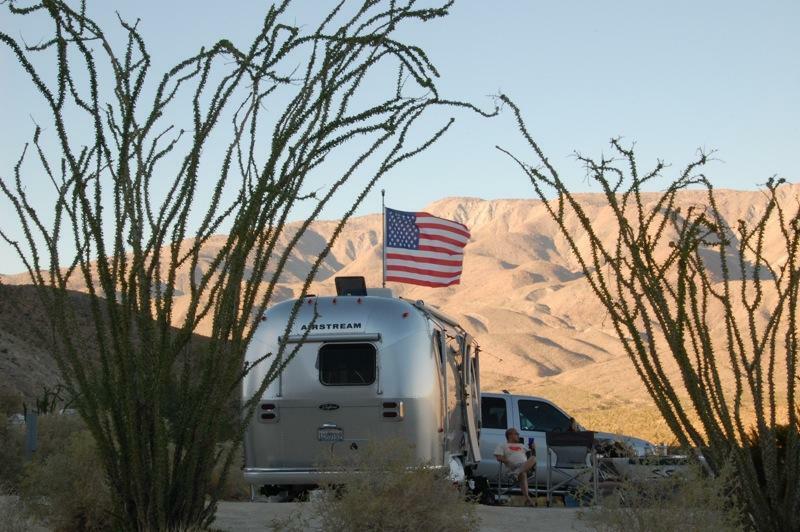 We are also thankful for our Safari Airstream with two solar panels and three awnings, which was a custom factory order placed on the day before Thanksgiving four years ago. 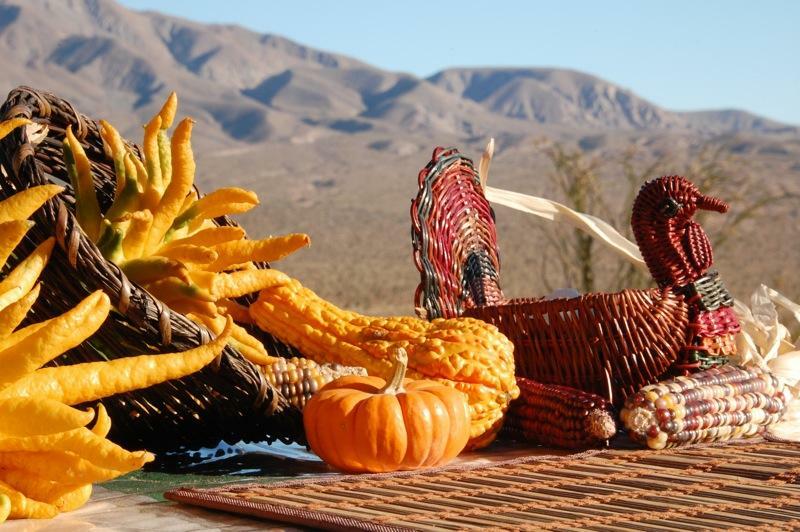 Vallecito Mountains are seen in the background of this Thanksgiving table setting. 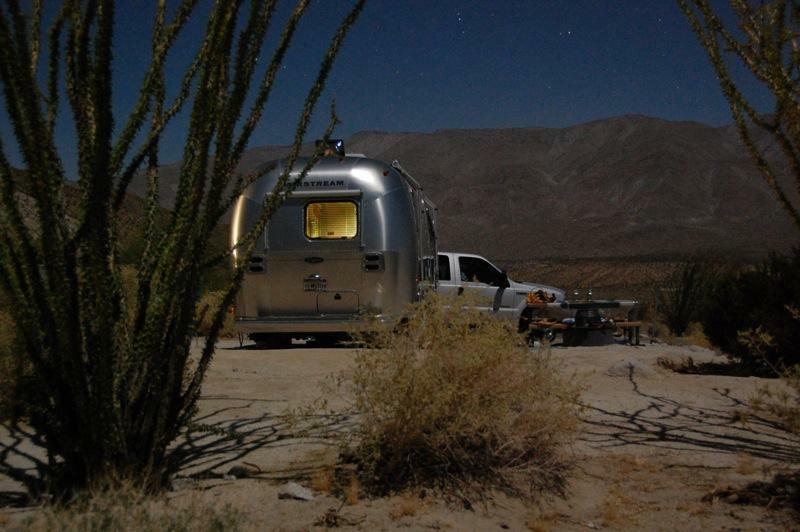 We were also thankful for the waxing moon, which brilliantly lit up our campsite and surrounding terrain. The Tierra Blanca Mountains are seen in the background. The Moonlight Canyon Trail is a 2.5-mile loop near here. 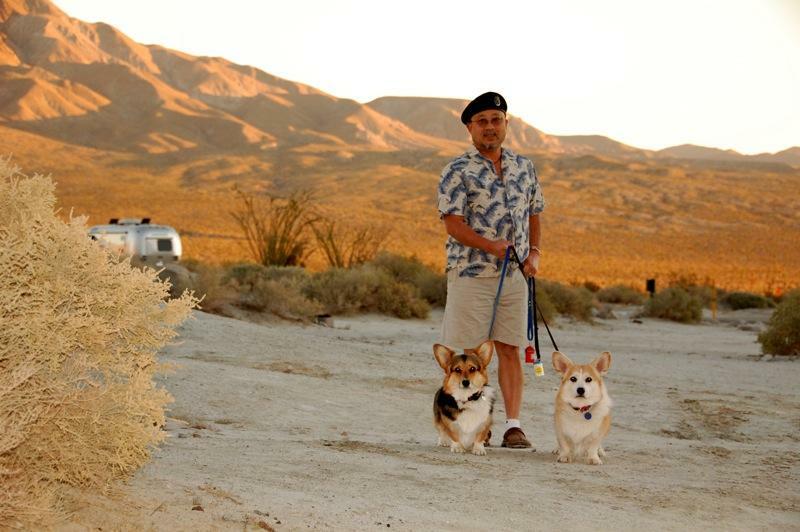 We are also thankful for our two wonderful Corgis, Mac and Tasha, who always enjoy camping. 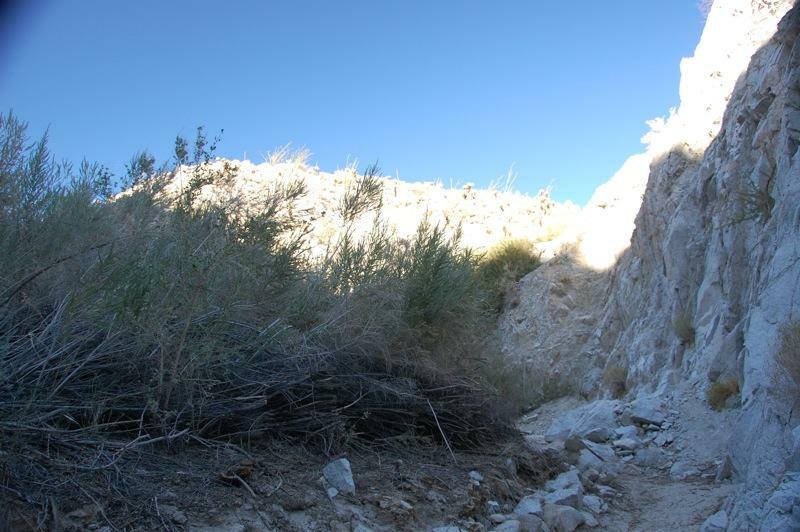 This has been a brief introduction to Agua Caliente County Park. Future postings will cover additional information and images of its history, geology, plants, wildlife, trails, and other features. Hear and see Ranger Kevin Benson give an overview of this park, along with its pools and therapeutic indoor spa, in the YouTube video, “County Chronicles – Agua Caliente Park“. We wish everyone a Happy Thanksgiving and invite you to listen to the beautiful “Thanksgiving” music by George Winston. Although some say “It Never Rains in Southern California“, we who live here know that it pours. We also have wind, ice, snow, hail, fire and thunderstorms that can quickly build and roll over our mountains. We often find ourselves experiencing varying weather conditions as we travel along the coast and through our local mountains and desert. Knowing weather conditions and forecasts is important to us before and during camping outings, and often becomes critically important in deciding the safest way back home to avoid possible local conditions of dense fog, rain, snow or high winds. 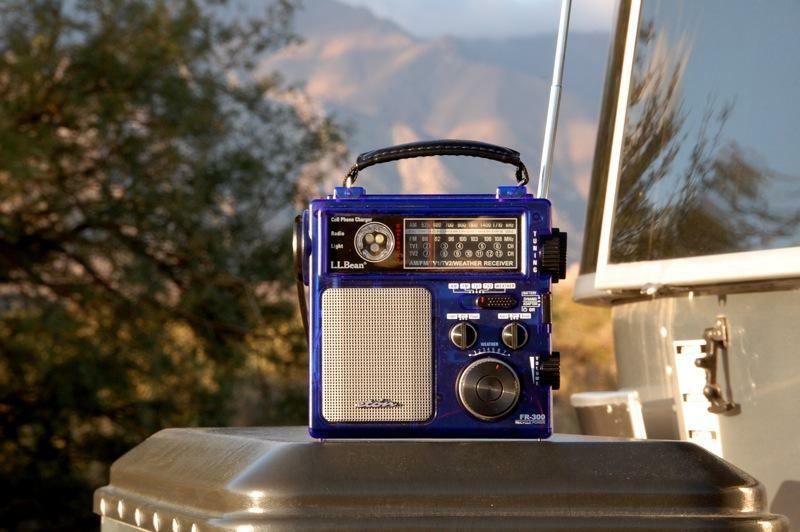 For the past three years we depended on the Eton FR300 Emergency Crank Radio, but the weather band failed earlier this year. So the search was on for the best weather radio to meet our needs. I learned that some newer radios come with SAME (Specific Area Message Encoding) technology that allows users to program codes for their designated area of interest, rather than the entire broadcast area. Specific Area Message Encoding is the protocol used to encode the Emergency Alert System (EAS), put in place in 1997, and NOAA Weather Radio‘s Public Warning System, which broadcasts continuous weather information from the National Weather Service (NWS), an agency of the National Oceanic and Atmospheric Administration (NOAA). There are many forms of weather radios available. In selecting one that was right for us, I was able to eliminate the larger or desktop ones and those that were loaded with gizmos that I did not need (such as a built-in flashlight, flashing warning/location light, and siren). 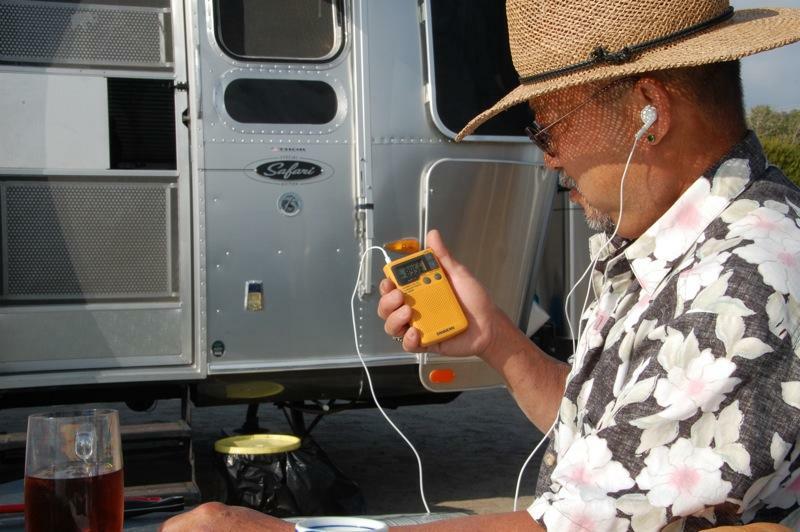 What I wanted was a small, easily transported weather radio that used minimal power and was dependable and got good reviews. 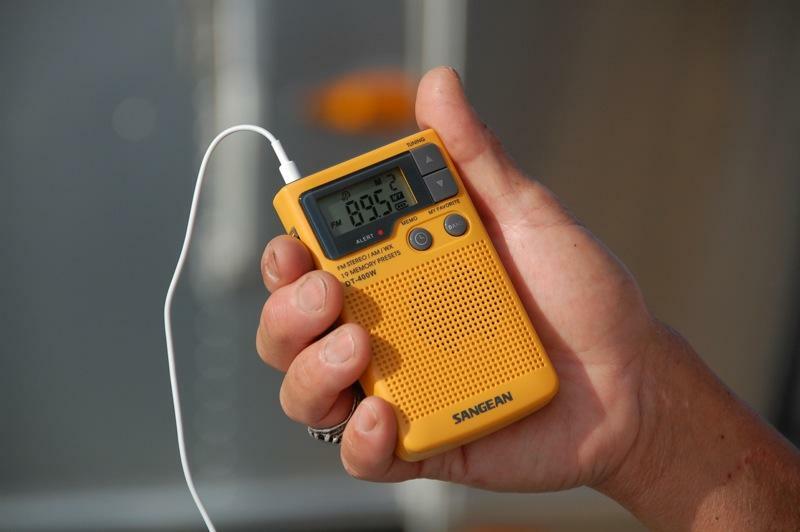 I chose the Sangean DT-400W AM/FM Digital Weather Alert Pocket Radio. Although this radio does not have the SAME alert programmable feature described above, it does have all 7 NOAA Weather channels, including the new NOAA Weather Alert Emergency Channel that can sound a loud audible tone when an extreme weather condition is imminent. My typical camping morning now starts by relaxing in a folding chair outside the Safari and sipping freshly brewed coffee, while listening to the weather followed by a NPR program or local jazz station. We bring extra batteries (of various sizes) so that we will not be caught by surprise by weather changes. This winter we prefer to frolic in the snow when we choose, rather than get stuck pulling a trailer through unexpected snow and black ice.